DCM has a prevalence of 1 in 2500 and is characterized by dilatation of the ventricular chambers and systolic dysfunction with preserved wall thickness. Familial DCM is predominantly autosomal dominant and can be associated with over 20 abnormal loci and genes (Fig. 13.1). 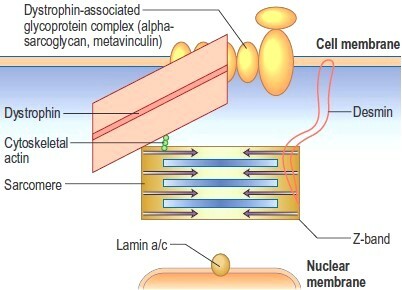 Many of these are genes encoding cytoskeletal or associated myocyte proteins (dystrophin in X-linked cardiomyopathy; actin, desmin, troponin T, beta myosin heavy chain, sarcoglycans, vinculin and lamin a/c in autosomal dominant DCM) (Fig. 13.2). Many of these have prominent associated features such as skeletal myopathy or conduction system disease and therefore differ from the majority of cases of DCM. • The prevalence of dilated cardiomyopathy in the general adult population is approximately 4%. • Incidence increases with age and approaches 12% at age 80 years. Patients have typical symptoms of right-sided and left-sided heart failure. Symptoms of pulmonary congestion (dyspnea on exertion, orthopnea, paroxysmal nocturnal dyspnea) and exercise intolerance reflecting the low cardiac output are the most prominent features. Many patients also manifest systemic venous congestion and anorexia as signs of right-sided heart failure. Angina pectoris is absent, however. Thromboembolic complications are not unusual and arrhythmias leading to dizziness, syncope, or even sudden death are a feared complication. Signs of biventricular heart failure are noted on examination. Auscultation usually discloses a third and fourth heart sound, and it is common to find mitral insufficiency and tricuspid insufficiency. Mitral insufficiency is sometimes severe and results from dilatation of the mitral valve annulus. It may occasionally raise problems of differential diagnosis. There may also be signs of decreased peripheral blood flow with cool skin and peripheral cyanosis, depending on the severity of the heart failure. Fig. 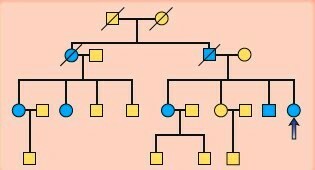 13.1 Pedigree of a family with dilated cardiomyopathy. Blue symbols are affected family members. The arrow indicates the index case. Fig. 13.2 Schematic representation of myocyte proteins implicated in dilated cardiomyopathy (DCM). • Cardiac troponin T levels: Persistently elevated troponin T levels are a marker of poor outcome in cardiomyopathy patients. • Treat CHF (cause of death in 74% of patients) with sodium restriction, diuretics, ACE inhibitors, and digitalis. • Vasodilators (combined with nitrates and ACE inhibitors) are effective agents in dilated cardiomyopathy. • Prevent thromboembolism with oral anticoagulants. • Low-dose ß-blockade with metoprolol may improve ventricular function by interrupting the cycle of reflex sympathetic activity and controlling tachycardia. • Diltiazem has also been reported to have a long-term beneficial effect in idiopathic dilated cardiomyopathy. • Preliminary studies have revealed that growth hormone administered for 3 months to patients with idiopathic dilated cardiomyopathy increased myocardial mass and reduced the size of the left ventricular chamber, resulting in improvement in hemodynamics and clinical status. • Use antiarrhythmic treatment as appropriate. Annual mortality is 22% in patients with moderate heart failure, and it exceeds 55% in patients with severe heart failure.